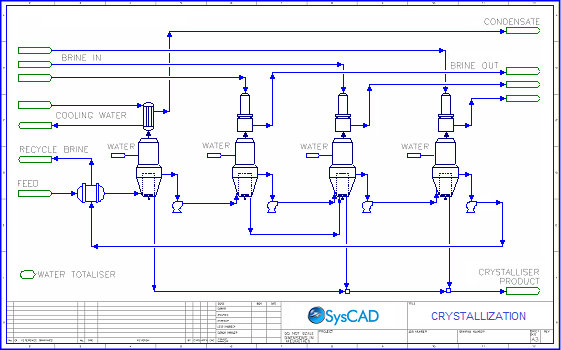 Online documentation for Kenwalt's process simulation software product SysCAD. Use the search box at the top right, or select a link below to investigate the main topics. Significant Reaction Block enhancements including new Extent Types, new Settings and Display options, new summary table of all reactions, solver improvements and more. New models, including Slew Rate Controller, Thermocompressor, Pressure Exchanger, Simple Condenser, Simple Evaporator and more. New SysCAD OLI add-on using OLI Reactor in SysCAD to call OLI Systems (olisystems.com) leading Electrolyte Simulation software. Separate OLI Engine license required. Improved a number of existing models and sub-models, including a number of new modes for Makeup Block. Please see What's New for all new features and functionality. See Revision History for incremental changes in Build 137. SysCAD 9.3 Build 137 officially released October 2017. SysCAD is a Process Modelling software package developed by Kenwalt and used primarily in the mineral processing industries. www.syscad.net for purchasing and contact information.